A recent study indicates that 20 million people in the United States have significant sensorineural hearing loss. Approximately 95% of those people have partial losses, with varying degrees of residual hearing. These percentages are similar in other developed countries. What changes in the function of the cochlea or inner ear cause such losses? What does the world sound like to the 19 million people with residual hearing? How should we transform sounds to correct for the hearing loss and maximize restoration of normal hearing? Answers to such questions require detailed models of the way that sounds are processed by the nervous system, both for listeners with normal hearing and for those with sensorineural hearing loss. This book contains chapters describing the work of 25 different research groups. A great deal of research in recent years has been aimed at obtaining a better physiological description of the altered processes that cause sensorineural hearing loss and a better understanding of transformations that occur in the perception of those sounds that are sufficiently intense that they can still be heard. Efforts to understand these changes in function have lead to a better understanding of normal function as well. This research has been based on rigorous mathematical models, computer simulations of mechanical and physiological processes, and signal processing simulations of the altered perceptual experience of listeners with sensorineural hearing loss. 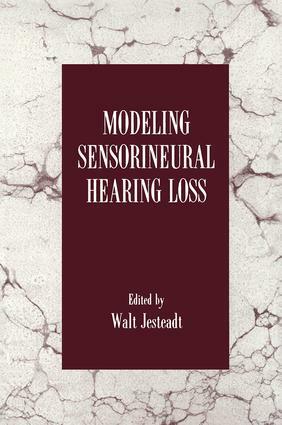 This book provides examples of all these approaches to modeling sensorineural hearing loss and a summary of the latest research in the field. "…provides a comprehensive overview of a number of approaches to modeling currently used in hearing research….it serves as a good compendium of the recent work of the most active research laboratories. This makes the volume a useful reference source for the reader with some background in hearing research and may be a good collection for a graduate course on hearing loss." Contents: Preface. W. Jesteadt, Introduction: Modeling Sensorineural Hearing Loss. Part I: Physiological and Perceptual Models of Sensorineural Hearing Loss. S.T. Neely, Introduction. E. Javel, Cochlear Excitation Patterns in Sensorineural Hearing Loss. R.L. Miller, J.R. Schilling, K.R. Franck, E.D. Young, Representation of the Vowel /eh/ in the Auditory Nerve of Cats With a Noise-Induced Hearing Loss. R.L. Jenison, A Computational Model of Reorganization in Auditory Cortex in Response to Cochlear Lesions. T. Lin, J.L. Goldstein, Implementation of the MBPNL Cochlear I/O Model Using the C Programming Language, and Its Application to Modeling Nonlinear Level Dependence of Auditory Function. J.M. Kates, Using a Cochlear Model to Develop Adaptive Hearing-Aid Processing. Part II: Simulation and Compensation for Reduced Dynamic Range. L.E. Humes, Introduction. J.B. Allen, Derecruitment by Multi-Band Compression in Hearing Aids. D.S. Lum, L.D. Braida, A Psychoacoustic Comparison of Simulations of Sensorineural Hearing Loss Based on Dynamic Expansion and Additive Noise. S.V. De Gennaro, L.D. Braida, Lippmann et al. Revisited: A Study of Multiband Amplitude Compression for Listeners With Hearing Loss Simulated by Masking Noise. E.W. Yund, T.R. Crain, Voiced Stop Consonant Discrimination With Multichannel Expansion Hearing Loss Simulations. Part III: Loudness Growth and Intensity Discrimination as Measures of Nonlinearity. L.D. Braida, Introduction. S. Launer, V. Hohmann, B. Kollmeier, Modeling Loudness Growth and Loudness Summation in Hearing-Impaired Listeners. M. Florentine, S. Buus, R.P. Hellman, A Model of Loudness Summation Applied to High-Frequency Hearing Loss. R.P. Hellman, Growth of Loudness in Sensorineural Impairment: Experimental Results and Modeling Implications. S.T. Neely, J.B. Allen, Relationship Between the Rate of Growth of Loudness and the Intensity DL. W.S. Hellman, On the Role and Structure of the Decision Variable Variance Function in Modeling Intensity Discrimination in Normal Hearing and in Simulated Hearing Loss. R.A. Lutfi, K.A. Doherty, Modeling Level Discrimination of Broadband Signals by Listeners With Sensorineural Hearing Loss. Part IV: Additivity of Masking as a Measure of Nonlinearity. M.R. Leek, Introduction. J.R. Dubno, J.B. Ahlstrom, Additivity of Multiple Maskers of Speech. A.J. Oxenham, B.C.J. Moore, Modeling the Effects of Peripheral Nonlinearity in Listeners With Normal and Impaired Hearing. W. Jesteadt, D.L. Neff, L. Humes, M.R. Leek, Modeling Hearing Loss as an Additional Source of Masking. Part V: Spectral and Temporal Processing in Listeners With Sensorineural Hearing Loss. S. Buus, Introduction. A. Boothroyd, B. Mulhearn, J. Gong, J. Ostroff, Simulation of Sensorineural Hearing Loss: Reducing Spectral Resolution by Linear Frequency Smearing. T. Baer, B.C.J. Moore, Evaluation of a Scheme to Compensate for Reduced Frequency Selectivity in Hearing-Impaired Subjects. M.R. Leek, V. Summers, Timbre Discrimination by Hearing-Impaired Listeners. C. Formby, T.G. Forrest, Measurement and Modelling of Modulation Detection for Normal and Hearing-Impaired Listeners. T.G. Forrest, C. Formby, L.P. Sherlock, Measurement and Modeling of Temporal Gap Detection for Normal and Meniere Listeners. C.W. Turner, Temporal Masking and the "Active Process" in Normal and Hearing-Impaired Listeners. M.L. Hawley, H.S. Colburn, Application of Interaural Difference Models to Binaural Performance by Listeners With Hearing Impairments. Part VI: Speech Perception in Listeners With Sensorineural Hearing Loss. J.R. Dubno, Introduction. C.M. Rankovic, Prediction of Speech Reception by Listeners With Sensorineural Hearing Loss. T. Ching, H. Dillon, D. Byrne, Prediction of Speech Performance From Audibility and Psychoacoustic Abilities of Hearing Impaired Listeners. I. Holube, M. Wesselkamp, W.A. Dreschler, B. Kollmeier, Speech Intelligibility Prediction in Hearing-Impaired Listeners for Steady and Fluctuating Noise. A.R. Needleman, C.C. Crandell, Speech Perception in Noise by Listeners With Hearing Impairment and Simulated Sensorineural Hearing Loss. M.S. Hedrick, W. Jesteadt, Influence of Relative Amplitude and Presentation Level on Perception of the /p/ - /t/ Stop Consonant Contrast by Normal and Impaired Listeners.